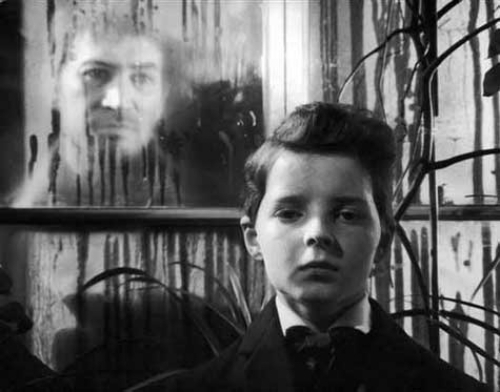 Screen shot from the 1961 version of The Innocents based on the James short story. A governess is hired to look after the nephew and niece of a man who has inherited the responsibility for the children after the death of their parents. He is very explicit in his instructions to the governess that he is not to be bothered with excessive communications. The governess is young and pretty and wants to impress her new employer by doing exactly what he wishes. She wants to be seen as competent, and in a sense this need to please proves to be a vulnerability that, as she tries to shield and protect, she actually puts everyone at more risk. Risk of what you might ask? That becomes the unknown element of the story. The reader doesn’t really know what to be afraid of. What nature of evil are we dealing with? The children are ethereally beautiful. The governess is compromised immediately by preconceived notions, that we all have to a certain extent, that beauty equates to goodness. ”I was dazzled by their loveliness.” When the boy Miles is kicked out of his exclusive school for unrevealed reasons, the governess cannot fathom what he could have possibly done to deserve this level of embarrassing punishment. It was inconceivable to her that he was capable of anything remotely improper. As the governess begins to try to understand her young charges, she also begins to discover that there are swirling questions about what has happened to other people who have been associated with the children in the past. She cross examines the housekeeper and more carefully the children, ferreting out bits and pieces of information that leave a murky picture in her mind. The reluctance which everyone shows in speaking about the past makes the governess more and more suspicious that something potentially perplexing lies in the truth. She starts to see dead people. Her first thought was to protect the innocence of the children, but maybe what she should have been more worried about was protecting her own innocence. It becomes a game of ignoring these phantoms in the hopes that the children would not become aware of the existence of these ghosts, of Quint, the butler, and Miss Jessel, the ex-governess. Both of these people were obsessed with the children when they were alive. The question becomes what do they want with the children now? Of course, without confirmation of the existence of these supernatural events from other people, one does naturally tend to start questioning one’s own sanity. Or is Miles just playing her. This is a short story, but it is a short story by Henry James. He has some of the same convoluted, difficult sentences that show up in his novels. They may bewilder on a first read, but after another go they start to make more sense. I’ve read enough James to find those complicated sentences, when they appear like Gordian Knots, more amusing than frustrating. This tale left me jangled and apprehensive as if an apparition were still strumming their fingers along the length of my sciatic nerve. If you read it on the most basic level as a ghost story, you will certainly find it unsatisfying. As I started to understand the deeper psychological implications of the interplay between characters, I started to realize that this is a tragedy with elements of horror that left lasting traumatic issues for those that survived.